Are you concerned at all with hitting 4-digits now with item levels, and power crit numbers getting too big again? Ion: Always. Yes. Yes. Numbers are definitely on the large side, we know that. It is likely that another squish of some sort is in the future; but in relative terms, we are already in the 900s, what’s wrong with another 20? It is more the importance that new rewards feel meaningful. I think this is something that players often ask: “Why does it have to be so much?” I know it feels so untidy. There is something inelegant about numbers so large, and often the concern is about what if they just made it only +5 level jumps (sort of), or whatever, or didn’t have such big gaps between tiers; and really what it boils down to is we want new content to be rewarding. We want– if you have been clearing Heroic Tomb of Sargeras on a regular basis, but you started in Normal Tomb of Sargeras, your guild started in Normal mode and then half of your tier you kinda worked your way to Heroic; and you finished the tier doing a lot of Heroic. Well, now you are going to start the new tier (Antorus Raid) in Normal again; and if that Normal gear is all downgrades, or sidegrades (like what you have from Heroic Tomb), then that’s a very unrewarding initial progression experience. Like you are wiping to new bosses that you have never seen before, and when you kill them they drop loot that is not an upgrade, that feels bad, and it is hard to see where you go from there in terms of getting better as a guild overcoming challenges you run into; and as we balance sort of what leads to the iLevel gaps; and what we have in expansions like Mists or like Legion, with many raid tiers, it is going to lead to fair amount of level increase as a result. I think it is inevitable, no matter what. What about fresh level 110 characters? Are they going to be able to jump right away into Argus with their gear, or I mean, is it going to be important to get the 910 catch up gear? Ion: I think literally a fresh level 110 planning to head to Argus will have a pretty tough time there. It is kinda comparable to like a fresh level 90 going to Timeless Isle, or a fresh 100 going to Tanaan. If you are up to the challenge, there are great rewards. One thing we did was, all the world quests rewards in Argus actually have a much higher floor than those back in the Broken Isles. Even if you are horrendously under-geared you will still see about 40 or 50 loot upgrades than those other world quests rewards out there; but there are a lot of catch up mechanisms that are in place in 7.3. Both in the Artifacts front, with all the relic slots being available right away for alt characters hat hit level 110, you will be able to get your Artifact up to level 54 without having to do the Broken Shore. Those should really help players jump right into the fray, as well as artifact knowledge being a baseline global value that will shoot right up after 41 for everybody at the start of 7.3; and then you just go up from there on a weekly basis. That is great on the catch up front there. In terms of items, the fact that the dungeon iLevel has increased, you can run Normal and Heroic dungeons — if you are 845 or 855 gear so you can chain-run some heroics. That will give a solid base if you want. If you are up for it, you can do Argus under-geared, but there has never been more avenues to get caught up. Why don’t we talk a little bit about the final boss of the raid (or what you can at least)? How about you talk about the lore behind that boss, and where he is coming from, and why we are fighting him? Ion: I am not going to do that. Sorry. The dungeon journal for that boss, as you may have noticed, is pretty blank. At BlizzCon, last Fall, we talked about Argus. We mentioned it in the briefest of terms, because there is no way to really explain how or why we are going to Argus without spoiling the hell out of the end of the Tomb of Sargeras; and in this case, understanding who or what that boss is, and why we are fighting it is a huge part of the story of Argus in 7.3. So we will know for sure when we get there. The dungeon journal won’t remain blank forever, but for the time being, it’s being a mystery. So we have seen some of them in the Dungeon Journal. All the Titans, and lorewise we heard that they are dead and they are gone. So suddenly, they have returned. Can you tell us something about that? Ion: Some things that you have learned– they were indeed effectively dead, but pieces of their souls, pieces of their spirits remain. Their titan souls. And they were a great source of power for Sargeras. Something that he sought to manipulate and corrupt, but perhaps as we journey through the raid, we can redeem some of those. Recover some of those, and they might aid us in the ultimate battle that lies ahead. Since Legion, we have noticed a lot of hidden secrets (i.e. Kosumoth or the Riddler’s Mind-Worm). Can you tell us if there are new secrets to be found in 7.3? Ion: There is definitely at least one new one. Yes. Outside 7.3, has your team discussed about making the old Azeroth zones relevant using phase technology and level scaling? What do you feel about doing that for the future of World of Warcraft? Ion: It is something that we would like to explore. I think it is not really relevant or the right fit in terms of where the story is right now in Argus. Going back to Westfall is probably the last of our concerns, but certainly for leveling characters there would be a lot of advantages if we could apply some of the scaling technology we used in Legion to those zones. We have much more flexibility and better pacing as you choose to level up. It is less clear how we would use that to scale max level players all the way back down. I am not sure it feels right to be a powerful adventurer or champion of the Alliance, or champion of the Horde and you go back to Elwynn or Durotar, and you are having a tough fight against a wolf or a boar that newbies fought back in the day. So I am less excited about fix scaling all the way up, but more about it as a tool to leveling players. One question that I know is difficult to answer — Is 7.3 the final raid tier of Legion? Ion: Yes, it is. We still have much story to tell, and of course, the raid won’t be opened until later in the year, and there is more of the story of Legion after that. We have been very effective, and very happy with how we have been able to tell the story of Legion through a mix of large patches and small patches; and sometimes even just non-patch live content updates. Like a couple of weeks ago, when Argus appeared on the sky for everybody and Doomsayers were in Dalaran, and the quest Magni had most recently. That is exciting, and we want to keep doing that. We want to keep telling a story, and never really feel like it reaches an end point, but just continues; but as far as big raid tier, I think yea. This is what all has been leading up to. There isn’t much left about Legion, depending on the outcome after Argus. In general, how do you feel about the balance of the classes right now? Warcraftlogs says Survival Hunters are the least represented spec right now, and are there any concerns about some classes or specs? Representation doesn’t necessarily matter as much, I think. We knew with Survival Hunter that we were making a niche spec. It is a melee spec for a class that has traditionally being range. I think that a lot of existing hunters, they are all hunters because they want to be a range class, and so we don’t necessarily expect them or want them to feel like they should be changing; but for new players picking up that class, it is an intriguing option; and we have seen a lot of Survival Hunters doing extremely well at very high levels of play. So the fact that they are not playing as often, I don’t think reflects upon their potential so much as it just does where the audience is at right now. That’s not much of a problem. There has been some discussion about artifact appearances, and recently we were told that not all appearances will be taken away, that they will still be attainable. Is it finalized yet or in discussion how that will be handled? Ion: It is still in discussion a bit, but I think for the most part our current thinking is similar to what was clarified at the stream Q&A a few weeks back. We think that after Legion, when the artifacts are retired, at that point players will learn whatever appearances they have as transmogs that they can apply to future weapons, and they can still go back and collect those appearances. The only exception would be a few appearances that are very skill-based in the current game. So specifically, the mage-tower challenges, as well as completing mythic+ 15. Those appearances will cease to be earnable after the next expansion comes out. Alleria and Turalyon are the main characters in patch 7.3. Are they also going to be important in the next expansion? Ion: Yes. I think the return of Turalyon and Alleria is one of the most exciting things in this patch for fans of the lore, fans of the Alliance storyline. We knew that Turalyon was around from going back in the beginning of Legion, when we did the Falling Star questline, and retrieved that message in the beacon. We are finally meeting up with him and of course when he is found, Alleria is not far behind. The focus for now is overcoming the Legion, but I think with characters as important as these, it is almost certain it is not going to be the last we see from them. What we know about them is that they were with the naaru all this time, and some new things that we learned about the naaru, and what is the role they do play. Can you enlighten us? Ion: The naaru are incredibly powerful beings of Light. You know, the diametrically opposed forces of Light and Shadow, and they are the benefactors that empower the Army of the Light to stand against the Legion; but they are mysterious creatures as well. Their motivations are not always clear or known to us, because how hard they are to understand. So learning more about them, and dealing with them in various forms is something that players have to grapple as they go through Argus; and that is a big part of the story for people to experience themselves. As for one other wing, it’s kind of related to the naaru. Is the other side of the Light: The Void, and we’ve seen there are some things out going on there. So what will we do? What is happening in 7.3? Ion: The second section of Argus is called Mac’Aree. This is a preserved piece of the old eredar civilization. Because it has broken off the planet, and it has been floating over the surface, it has been largely untouched by the fel and the Legion’s influence, we get to see a piece of their old civilization; and as part of that, there are was a naaru within the Seat of the Triumvirate dungeon; and as we have seen in places like Mu’ru in the Sunwell, naaru that are sort of left alone, or naaru that are exposed to corruption, they can become shadow. They can turn to the void, and actually become a powerful source of darkness. So there is something very wrong in Mac’Aree as some people will discover, and there are patches of unleashed voids that are all over the place, and it is a very different sort of threat than what the Legion has come to pose to us, but it is something that we are going to have to brave if we want to recover some of the powerful relics that are within that we need to fight the Legion; and of course, in doing that, we are going to learn a bit more about the nature of the Light, and the nature of the Shadow; and Alleria Windrunner is going to be our companion through a lot of those journeys. I have also seen some Ethereals coming back too. Can you tell us something about their role in the story? Ion: Yes, and I think they are in some way a race that has been connected to the draenei, connected to sort of space-faring. They make a lot of sense making an appearance on Argus; and there is a group of Ethereals that in particular have an affinity to this void energy, and they are going to be known as one of the players’ primary enemies in that second section of Mac’Aree. I have one final questions for you. We have seen from some other video game by Blizzard, that Jaina is a dreadlord. Are we going to see more concerning that in World of Warcraft? Ion: Jaina is not a dreadlord. Heroes of the Storm, much like Hearthstone in many ways, is not canon when it comes to the lore of World of Warcraft. I know. Our good friend, Jessie Cox, is a source of great and enduring meme**, and paying a homage to memes is a wonderful thing to do with skins, especially in other games, but maybe we will hear more from Jaina in the future, but she is not a dreadlord. I think Jessic Cox will not like to hear that. Ion: Sorry, Jessie! Not a dreadlord. Ion: Of course. My pleasure! Thank you. 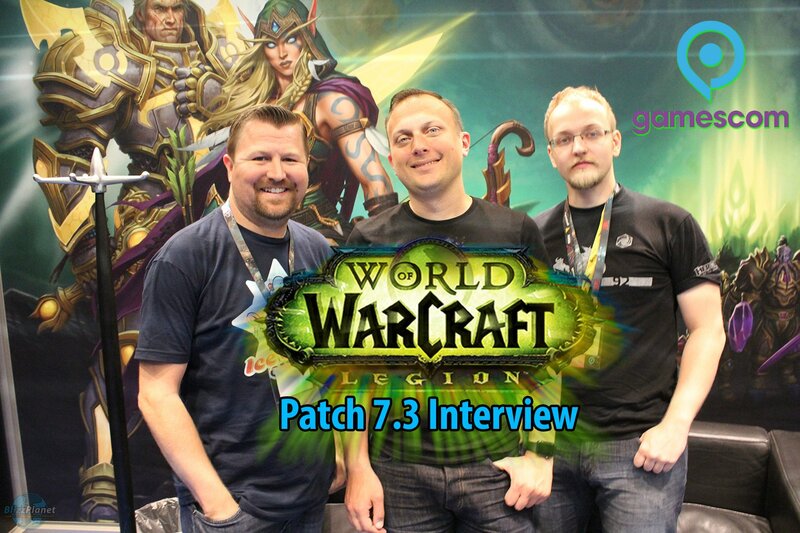 Special thanks to Blizzard EU PR Team for scheduling the interview, and to game director Ion Hazzikostas, as well as the Reddit WoW community for helping put together the questions for this interview. Props to the interviewers: Danny Perschonok (Naka), and Arthur Lorenz (Handclaw). Transcript by Tomas Hernandez (Medievaldragon). **Thanks to @Arogan_WoW for assisting with the “meme” portion at the end of the transcript.